Around 12 months ago I had a lightbulb moment when it comes to keyword research. I started testing the concept on a small scale, using free tools, and the initial results were honestly incredible. (I test a lot of ideas and this doesn’t happen very often). I quickly scaled things up and automated the process, and that lightbulb moment ended up being one of the smartest things I have ever done in my thirteen years in SEO. In this advanced keyword research guide I’m going to show you exactly what that idea was, how you can implement it today, and give three more advanced tactics I’ve never shared to go with it. It’s great to be blogging again. I will never call myself an SEO guru but someone who deserves that title called this following tactic “brilliantly simple” so I hope you’ll feel the same. The concept is this: If new websites are ranking highly for terms that get thousands of searches per month, those terms are likely easy to rank for with a new website of your own, or even easier to capitalise on with an established site. I theorised that if sites under two years old are ranking well for terms worth targeting then I want to know what they are so I have a chance of ranking for them as well. Young websites haven’t had as much time to establish links and authority, so the rankings are probably skewed towards “freshness” and on-site SEO. Thanks to acting on this idea I found not only the most incredible keywords to target, but also the most incredible link sources and niches to enter as well. I have never seen anyone else teach this, so hopefully it’s new for you as well. This free method is incredibly slow and there’s a good chance you’ll give up before you find anything valuable. I didn’t have money to spend on “messing around” when I started out online so I’m including this in the hope that it might help just one person. To start with you’ll need a list of dozens or hundreds of keywords related to your niche that get between 500 and 5,000 searches per month. I picked this range as most terms receiving less than 500 searches probably aren’t worth targeting, and those that get more than 5,000 are less likely to have ‘young’ sites ranking. As this is an advanced keyword research guide, I’m not going to go in-depth on how to build an initial batch of keywords. There are a million beginner guides out there that will cover this for you. Once you have the terms, simply head on over to Google and start searching for them. If you’re unfamiliar with any of the sites ranking (e.g. they’re not huge brand names like Amazon), put them in Whois.com or any other WHOIS checker and see how old the domains are. If the site is young and it’s ranking on the first two pages for your chosen keyword, awesome. Use Ahrefs, SimilarWeb, SEMRush or similar and see how much traffic they’re getting overall and what other terms they’re ranking for. It will be slow as I say, but if you’re on a budget you can do this all day every day without spending a penny. Keep in mind it only takes one site to be a great ‘hit’ for you to find a lot of terms to target by looking into other queries they specifically are ranking for. Both parts of the free process are incredibly slow. It’s slow to enter every query into Google and go through each search result, and it’s slow to take each site through a Whois checker to see how old it is. To solve the first problem you have two great tools to help you. One is Scrapebox, which retails for around $99, and the other is SERPScraper from URLProfiler which is completely free. Both tools allow you to extract Google search results for as many queries as you like. Note: This practice goes against Google’s Terms of Service. What you will be doing is 1/1,000th of the level that any rank tracker or similar service offers (and they profit from this data) but I do have to be responsible and give a heads up. Something to keep in mind is that you’ll need to use proxies if you are going to do this on any kind of scale. If you aren’t using proxies, there’s a good chance Google will ban your IP, or your VPNs IP, and render you unable to do this work for a while. I’ve never had a problem with BuyProxies.org who offer 50 semi-dedicated (shared) proxies for just $40 for 30 days. Their prices are monthly but you don’t get tied into a contract. Payments are once-off when you need them. How many proxies you need will depend on how many queries you are looking up and how quickly you want the results. The more patient and ‘human’ you are, the fewer proxies you’ll need. For the Whois side of things, you don’t have to spend any money as there are a lot of bulk Whois checkers which allow you to check up to 500 domains at a time. I’m hesitant to link to any because they frequently stop working. Honestly, a simple Google search for “bulk whois checker” is going to be your best solution. I’m not being lazy; they just tended to break when I personally used them. With this method you can easily check thousands of sites over the course of an hour or two. It’s not incredibly fun, but as I said in the last section, you only really need a few hits (a very young site with a lot of top rankings) before you delve deeper in their keyword and backlink profiles and learn a ton in the process. If you’re a programmer or have someone on your team is a programmer, you may have a far better idea of how to tackle this concept than what I’m about to share. This is just the way I went about things. If you have a better approach, act on that. The first tool I used when looking to scale up was DataforSEO. They allow you to pull back the search results for as many search queries as you want without having to use Scrapebox, proxies and so on. They handle all of that for you, and can do so at massive scale. They can get pricey as you have to deposit a minimum of $500 to continue using the service after your free trial is over. I don’t have any relationship with them and there are no affiliate links in this post, but they have incredible support and I had no reason to use any other offering. The next tool I used was a combination of WhoAPI and something custom a programmer made for me (I don’t know exactly what, or why, as WhoAPI worked well). They are incredibly cheap – starting at just $16/m for 6,000 Whois requests – and the founder, Goran, offers excellent support. I’m not going to go into detail on how to link these together because anyone considering this option should either a) be able to figure it out very easily or b) expect to hire a programmer to do it for them. Telling you how to use these tools would turn into a blog post teaching you how to program and that just isn’t feasible. Put simply, the better your solution for combing through search results and verifying the age of the site ranking, the better you can scale this process and find even more valuable data. I spent weeks on this project initially and trawled through thousands upon thousands of search results, filling up Google Sheets with hand-picked sites that I would later delve into in massive detail. I’m not exaggerating when I say I found the best keywords, backlink sources and niche ideas doing this than anything else I have ever done. After all, the entire concept makes logical sense: If young sites are ranking for popular, intent-focused queries, those queries are worth looking at; as are the backlinks that helped them rank. I first started doing this in 2017 so domains registered in 2015 were / are still super relevant to me. I should make one concession and say that using Whois is not a perfect way of finding young websites. Let’s take my other blog, Gaps.com, as an example. If we run Gaps through Whois, we see that the domain was registered back in 1995. Even though I’ve been running the blog for less than two years, it would not be ‘pulled back’ using any of the methods above. With this method you’re only going to find domains that were first registered in the last three years (or however long a timeframe you want to look at). As I say, if you’re technically savvy or someone you work with has a better idea, go with that. I’m just sharing my own personal approach. I’ve heard people throw out ideas of looking at website changes in Archive.org but honestly, I just didn’t need to get to that level. I was able to find more data than I will ever be able to process or utilise myself, so I have no problem sharing this tactic with others who I hope can get value from it as well. As a final note, I think to do things the right way, I wouldn’t make this data public. When I initially shared this concept on a webinar a few months ago (shameless plug: join my newsletter if you want cool stuff first), a few people started thinking about all of the ways they could profit from this data. Use it and benefit from it, but I personally wouldn’t reveal and ‘out’ the sites you’re trying to model and compete against. I could have dedicated an entire blog post to this concept alone, but let’s keep going. One day I’ll talk about how I use Google’s Custom Search Engine for link building, but for now let’s look at how it can be applied to keyword research. If you’ve never heard of it before, Google offers a tool where you can build your own search engine that allows you to search the entire web or just specific sites. I often want to know what my direct competitors are up to when it comes to content marketing and SEO and custom search engines make that a lot easier. With a Custom Search Engine (CSE), I can search only the specific sites that I judge to be my competition in various niches. For this first example I’m going to take some of the world’s best design blogs from our own rankings and add them to custom search engine. With a simple intitle: search we can see which keywords they’re focused on for month based search queries, which tend to include fresher content ideas you may want to mimic. It turns out targeting design trends with monthly search queries is a thing, and something I would probably replicate if I was in the industry myself. I can also see that wallpapers are searched for with queries that change each month as well. Another angle I might want to target. If you have a big enough list of sites in your CSE you can also see who is already targeting search terms for 2019, for example. You would be surprised how many sites are already focused on search queries from the future. Here’s good topic idea that could apply to most niches: Ranking for discussions about conferences in the space. If you get creative with this, you can use terms that would be messy looking through the entire internet for but be incredibly lucrative when you’re only searching through your competitors’ websites. I promised this would be an advanced guide so let’s kick things up a notch. Something I don’t think many people know is that you can actually set your own sorting options in Google CSE, at least to a degree. What this allows you to do is sort by keys specified in PageMaps, rich snippets markup or metatags. For example, if your content is marked up with Reviews rich snippets, you could enable sorting by rating (number of stars) or other numerical key. If your content includes a PageMap identifying a publication, you can sort results by Publication Date. Inspired by Google’s own example, I set-up a key to sort pages by the number of reviews they had received. Perfect if you’re in a niche where people are likely to rate things and you want to know which pages to build out first or which products you may also want to promote. Keep in mind that you can use a Custom Search Engine to search the entire web. You don’t have to pick sites to include. The keys can apply to most schema markup; just make sure you have included enough sites in your CSE (if you’re adding them manually) for the results to be useful. I’m still finding new uses for this myself so if you figure out anything super useful please do leave a comment and let me know. I would love to hear how you’re using it! The first strategy in this guide was all about finding young sites so you can possibly mimic what has made them rank so well, so quickly. We don’t just have to apply this theory to young sites; we can also do the same for young pages. You will need premium tools to have the most fun with this – such as Ahrefs or BuzzSumo – but I’ll also show you a ‘hacky’ way to do this if you don’t have any money to spend. To begin, you’re going to need to pick out some of the biggest sites in your space which frequently publish content. Don’t pick a site like Business Insider or Huffington Post that cover every topic, but rather an authority for a particular niche. In personal finance that would be the likes of NerdWallet and Value Penguin. Once you’ve picked some big names, head on over to Google and perform a “site:” search while changing the date range to find articles that were published between three and eight weeks ago. You don’t really want anything younger than three weeks as Google have a tendency to rank new articles highly before they ‘drop’ to their rightful position. On the other hand, going past eight weeks means articles have had more time to pick up links which might make competing a little more difficult. You can see an example of this in action below using NerdWallet as the site to investigate. Even though the date associated with the first article is recent and NerdWallet rank well for related queries, this wouldn’t be a good example to dig in to. Well, it wasn’t actually published in 2018. Thanks to Archive.org we can see it was published back in 2017, which kind of defeats the point of this experiment. If we keep going through the search results we can find more examples, such as this article on vinyl siding. I couldn’t find it in Archive.org, and as a cool little trick, I also opened one of the images see when it was uploaded by its URL. This works on most WordPress sites. The post states it was published in July of 2018, and images uploaded into the article match that based on their URL structure, so there’s a great likelihood that’s when it first went live. We can then search for queries we think the article has a chance of ranking for, and help verify our suspicions using the free keyword data from a Chrome extension like Keywords Everywhere. Without spending any money, it’s fair to say there’s a strong chance that this recently published page is ranking well. I can confirm that’s the case with premium tools. This process isn’t particularly fun, and it will take time, but it is a free tactic you can add to your arsenal. If you’re worried that the sites are ranking so well because of non-freshness factors (like links) you can always do these checks on ‘lesser’ sites in your industry. If you have access to premium tools, you can make your life much easier by using the likes of Ahrefs or BuzzSumo. Ahrefs’ Content Explorer is perfectly built to take advantage of this angle. Not only will it allow you to find recently published articles by site, but you can get a great estimate about how much search traffic they’re pulling in and what terms they’re ranking for. (Disclosure: I worked with Ahrefs on a once-off project this year but have been a paying customer – and recommended their tools – for many years before doing anything together). BuzzSumo is probably the closest competitor – you can see when particular content was published – but you will only get their link and share counts, rather than organic traffic stats. Typically I would mention SEMRush or Moz when I cover Ahrefs but I don’t believe either have any content-related features. In Ahrefs you can see I have performed a site-search for Smashing Magazine, chosen the date range the articles should have been published in and then sorted them by those that get the most search traffic. We can see that Smashing Magazine published an article at the end of July which is already pulling in hundreds of visitors due to search results for “august desktop wallpaper” showing fresher results. You can do this for any site in any niche, and is a huge timesaver if you can afford the tool. You can get a ton of ideas from this tactic alone so take your time and have some fun with it. If you do have an Ahrefs account already, enjoy checking the recently published article from Medium.com (using the same dates above) that’s getting the most search traffic. Have you ever found yourself clicking on a search result and thinking, “This is a terrible website”? Try to stop yourself in your tracks next time. You might have stumbled upon a great site to compete with. This next strategy plays on the idea that some sites rank well but probably shouldn’t, or likely won’t one day, so you can use what’s working for them to your advantage. You may have your own idea of what a poor search result is, but I often find terms to target by specifically looking into forums. Forums can be fantastic resources, and if you count StackOverflow as one then some will be next to impossible to outrank, but there are a lot of dated and ‘thin’ results out there which are fairly easy to compete against. I won’t insult a particular site so rather let me focus on what I think are poor search results by starting with my favourite niche, the makeup space. Typically, a forum would be the perfect destination for a question like “is ipsy worth it” as you can get lots of opinions in one place. That said, there haven’t been any updates on the the Makeup Talk thread in four years. That’s a really long time for an offering to have improved or gotten worse. Surely new content would be far more valuable to a searcher. Though the second keyword example has been discussed a bit more recently (two years ago), the majority of feedback in the thread is from 2007. There are millions of forums out there so you really can use this for any niche. Another option is to find out what is ranking well in specific Reddit subReddits. There are “only” 15 comments on the page, which is pretty low for Reddit. The first is asking the same question for Canada. The second is deleted. I could comment on them all, but I’ll get to the point: Not a single comment answers the searchers query. Everyone is just asking for the same thing. With millions of subReddits, RedditList is a great resource to get an idea of sections of the site to look into. As I was putting together this article, my friend Dan tweeted a great example of this in relation to local content. He argues that when Yelp ranks well, you may be able to outrank them with actual content, rather than just a list of places that offer that actual thing. Which sites do you constantly see in search results that you don’t really think provide the best search result. I don’t mind going up against the big guns if I think I can produce something dramatically better. On Quora especially, I constantly find search results where the first few answers are nothing but people promoting their own websites. If you’re on our SEO secrets newsletter (opens a pop-up) you would have learned in secret #3 exactly how to extract the top quora pages in any niche (and their exact view counts). A few weeks ago I went live with a brand new Detailed homepage where I’m more focused on building a newsletter (opens a pop-up) around this website. I’ve just went live with secret #4 where I reveal two more advanced keyword research tactics I have never seen shared anywhere else. One of them comes to us thanks to Kinsta, a 7-figure WordPress hosting company, who were kind enough to share actual traffic screenshots from a tactic that is bringing them paying customers. It’s really smart, and it has been getting some great feedback. If you have any questions or feedback, please do let me know in the comments! 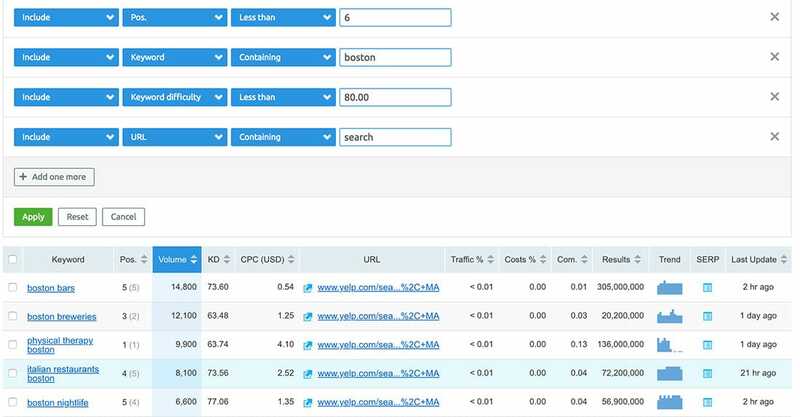 Figured someone was going to start talking about this.. very well done (as always).. bolt on a search intent mapping process to this and you have a scalable process for finding conversion-focused terms that are easy to rank for all. day. You’ve got it man. Great to see you here! The Bank of Eubanks. 2020. I believe. This guy just stole my idea. Before I opened the article I was thinking if that strategy could be the one I would not want to be found by every SEO marketer. But there it is, the strategy laid out a few paragraphs from the top of the article. Nice from you to offer the public such an awesome pro tip. Right now, I wouldn’t even feel ashamed to post about it just because you did it first. xD What I am even more impressed is that I respect you and I’m amazed we both thought about the same strategy. For that thing I’m feeling rather proud. It’s a well researched article about keywords. Wish Ahrefs would just make this easy and I could setup a “custom report” for any domain that has a DR of less than 15, organic traffic over 10k/month and traffic value over $5k. Sure some of them may be older than 2 years, but clearly they’re getting good value traffic without lots of links. I know they have thought of this. Not sure if it will come to fruition but it’s definitely on their radar. Solid info glad I came across this in my email. Did I see you mention something about a FB page at the bottom. I don’t see it. Thanks. Sometimes I find new domains (only 2-3 years old) with good amount of backlinks from high authority websites. Replicating those links will not be easy at all. Do you still suggest to focus only the “Age-factor” to determine the targetable keywords? Of course, some sites will have done well when it comes to links, but it just means you need more data if you want to find ones that haven’t. (And it’s pretty cool to dig into what they’ve done links-wise as well). Wow, thanks for sharing this Glen! Love your age checking approach. It’s a good way to find the most effective backlinks too since they’ve pushed young websites on top. Glad you like it, Vladimir. Thanks for stopping by. Good stuff Glen. I love the way you dissect things and bring such amazing insights. BTW, if you are going to use Scrapebox, they have a bulk whois addon which does the job pretty well. Thanks for the comment, Sanjay! I’ve never regretted signing up for your newsletters Atall. Loved this! Tried to sign up for your newsletter and noticed the link isn’t working yet. Don’t try to open it up in a new tab (it’s a pop-up). Will mention that. I am not an expert but SeoQuake extension gives you the domain age directly on the SERP, isn’t it? Very possibly! I don’t use it myself. This looks really serious. Thank you for as always a fantastic job with the article, which beats many paid one. Really interesting post. So this isn’t exactly related but your article spurred some thoughts. Do you think there’s a kind of “SERP Hardening” (like with concrete) that happens with older sites that stay high up in the rankings over long periods of time? For example if the site fluctuates between 1-10, then a year later between 1-5, then a year later between 1-3, etc. Rohan here from SEMrush. Thanks much for the *awesome* ideas! You can also monitor the performance of your guest posts (and check how it ranks for custom keywords that you input) with the Post Tracking feature. Let me know if you find it interesting 🙂 Thanks again for this post! This is only for websites you own though, right? If so, then it wouldn’t really be useful in this regard. Please do let me know if I’m wrong though. Happy to update the post! Thank you so much for mentioning WhoAPI, my eyes literally almost popped out once I saw you mention my name! It’s pointless to try to single out one thing, but the trick I liked most is the image URL with date of the publish. That’s like a dead give away for a WP website! Another thing I am thinking about is the vetting process when I am buying a website. It would be great to push that domain name through a tool that lists it’s pages that are ranking high at the moment, but are “vulnerable” for take over! That would be a great tool. Very useful, as usual 🙂 I was just wondering if there’s a search operator we could use directly on Google to search for products with a specific reviewCount or ratingValue, or other things structured data related. This combined with your tips in your webinar recently just highlights how much i still have to learn analysing websites/keywords online you always think outside of the box its awesome. The freshness ideas that get used – i wonder how many of the updaters update the images too to change the urls which will help make a page look truly updated, something i will start to do. Awesome Information..thanks for sharing and keep posting….. Pop links to newsletter are not working on mobile. That’s strange Stuart, they are working fine on my phone. Are you perhaps on an Android device? I am big fan when it come to SEO reverse engineering, i even built a dedicated keyword tool that take into consideration domain age and page age for keyword ranking factors when i found that most of other tools lake of this important feature. #1 Stackexchange have subdomains that are niches on their own. If you use Ahrefs, it’s pretty easy to narrow them down and target easy-to-rank-for keyword terms (via the Top Pages report). Hope this helps whoever reads it! Your content is really awesome and helpful. You’re probably the only SEO guru I know who doesn’t carry that label around. Always learning, tweaking, and experimenting with new ideas every now and then. I’ve learnt a lot from you in just the space of three years that I started following you. Keywords Everywhere is something new I learnt from this article and I already installed the extension on my browser. Such a great content, these keywords guide is indeed helpful to establish an advanced tactics for better optimization. New and fresh ideas that when properly leverage could definitely attract relevant and organic search traffic. wow, you just what we were searching for man. It’s a well-researched article about keywords. Hi Glen – As always tips and tricks that one can use in SEO business. Hopefully, some of our clients can really benefit from it. Thanks for this technique. By applying this method, I found many websites creating dummy articles on some dubious free blogging sites with links to their pages they want to rank high in Google. I used to think Google would disregard these dummy links as ranking factors but no. All of them manage to rank higher for their targeted keywords. I don’t know whether I should get angry at these sites for using unethical tactics to outrank my site (as some of them are my competitors) or I should be happy to discover a lot of easy to replicate link opportunities. I am tempted to go ahead and create tons of links for my sites (and posts I want to rank high for) but I find it unethical to do so. Do you think there’s a way to inform Google about this dishonest tactic and make them disregard those dubious link sources as ranking factors or is it a common strategy in SEO circles to find what it works and go with it? Excellent Post. Loved the research you have put in creating this content. Great tips and tools! Though free method, as you rightly put in, would take too long and as the level of ease rise, so does the money. I wish there were free tools available to do this advance keywords research. Any body??? Open source guys???? Lots of great ideas and tools to use in here. I’ll definitely be checking out URLprofiler, as I haven’t used that one yet. I can’t even count the number of times I’ve come across one of those terrible websites and wondered how it got in the top 10 of a search result. Crazy stuff sometimes. Glen, I must say that you have just nailed this topic. Really new ways to find out keywords specifically searching the keywords other sites have ranked for within weeks. I liked that idea and will implement that to get more opportunities to work on. Thanks Man ! This is fire! I never thought about this kind of angle. I will get my hands dirty and program a script and run it through the keywords I am already ranking for to see if the easy rankings from the past co-relate with Strategy #1. Hi Neil, thanks for that. So which tool you could recommend as the main one? I need to see the difficulty and suggestions. I’ve been using Ahrefs, but it costs a fortune. Is there a tool that can provide a reasonable info on kw difficulty and a good number of suggestions? Spying on competitors is nice, but I just need keyword research at the moment. Thanks for sharing very informative information for Advanced keyword research. SEM and Ahrefs tools are a very useful tool and you have explained very well to do keyword research. Glen, It’s a really interesting post to read. You have mentioned almost everything in it. I keep trying different tools for keyword research so I came across to your post while looking for best tactics. Looking forward to getting such posts from you soon. wow, this is a science that I have never found in my country, I am very grateful that you have shared this. this will be very useful in my community..
Great post! Keyword research is really important to rank on search engines. But I think along with a keyword, the topic relevance is also very important. Amazing keyword research article! Read a lot of articles but not in depth like this one on keyword research. Thanks for sharing! Great article! It’s also easier to rank for keywords that are relatively new – for example a recent product launch so the faster you take action, the better you will do in SERPs. Launch jacking is among my favorites! Thank you so much for sharing this articlesir, it’s too helpful for us.. Thanks so much for sharing these excellent tips. These are very helpful. I’ve been using it for some months now and the results are great.